If you missed the Facebook live, check it out HERE. Can you imagine going to the grocery store, buying oodles of groceries, and then just dumping a few of the bags of groceries from the garbage? You may just be doing this. So lots of people (myself included occasionally!) Head into the store with no plan set up, purchase items they may not use, and things end up getting wasted and thrown away ~ literally 25 percent of food in the usa is thrown out each year. But you and I will resolve this. Crocktober wrapped up last autumn, but back by popular demand we’re doing a quite similar series this February known as the Countertop Cooking Challenge. (I believe you’re likely to adore it!) We are likely to have a menu program, grocery list, and recipes pulled together until the week even starts. 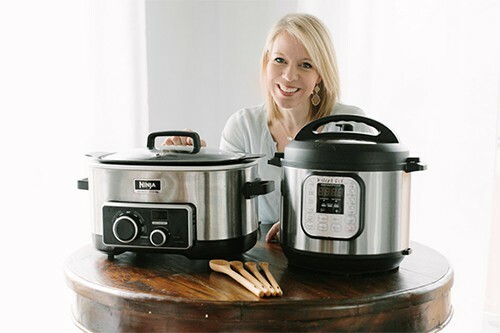 Beginning Monday, 2/26/18, I’m teaming up with my friend Tiffany from Eat Home Cooks to bring you Crockpot and Instant Pot recipes for, and each single one of us is going to acquire supper done. To make your life waaaayyyyy easier (and mine too!) We’ll use Tiffany’s Eat at Home Menu Plans ~ which I have been using at our house and they are just excellent. I promise, these will help you save a bundle! In actuality, those who shop with a menu plan and grocery list save 25-50 percent each and every week in their food expenditures. And, a menu program all the sudden makes grocery shopping easy. You’ll actually eat well balanced meals by what you have in your kitchen and also bypass the drive thru. During the February 2018 Countertop Cooking Challenge I will be cooking to get a complete week like grocery lists and menu plans, and Tiffany and I’ll be cooking up them each day straight up with you. My favourite part is that each morning I will talk about a Facebook Live Video filling up Mrs. Potts (a.k.a. ~ my slow cooker), and it would be stinkin’ pleasure for me if you were on the other side of the screen filling Mrs. Potts in your kitchen also. For only today, Tiffany is offering the cheapest prices she is offered on her menu plans 30% off using the code EARLYBIRD at checkout. Basically, you are going to get 72 recipes using menu plans AND A GROCERY LIST, all included! The menu plans cost as much as $1.13 per week once you sign up for a 1 year program, or try out a 1 or 3 month subscription and see what you believe. And, if you’re like me you’ll use the supermarket list along with the Kroger Click List (watch the video above), and also make grocery shopping and menu preparation so mad easy you are going to have it done in 30 minutes or less. And I’d just love that you join my free personal Dinner’s Done Facebook group to acquire a great deal of support and encouragement as we all get dinner done in February. It is likely to perform be a wonderful week! Searching for more ways to have dinner around the table? Be sure to sign up for my free Crocktober Cookbook using menu program and grocery list. I can not wait to begin countertop cooking with you! The article Countertop Cooking Challenge appeared on Passionate Penny Pincher. Rooms in a nice house that is Large.